Searching the web one day, was a perfect moment for me. I came across an ad that said actors/actress were needed for “Struggles Within” a short film about depression told through dance. 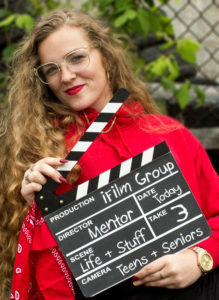 Getting an amazing role to play one of the main characters for my first film with iFilmGroup, really took me out of my shell. I’ve felt confident in my work ever since. I was given the opportunity to work with Matthew, Don and the rest of the crew not only on “Struggles Within”, but also on the dramatic film “Blue Love” which I had auditioned for and thankfully got a role as a street girl as part of a gang. The entire production team has allowed me to gain some great experience in the film industry and have a better understanding of what to expect next. Not only did it build me as an actress but it helped build me as a person. Thank you Matthew and Don for believing in me, and helping develop me into who I am today. I’ll forever remember these moments we’ve shared as a team and will carry them on with me as a learning experience.